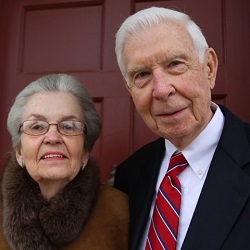 Touching lives in the places that shaped their own, Bill and Elizabeth have contributed to and set up need-based college scholarships for high school graduates in their respective hometowns. For Elizabeth, this is Tarboro, NC, while Bill’s roots are in New Jersey. With a scholarship fund established through WCF they help a chemical engineering student attend Bill’s alma mater, the New Jersey Institute of Technology. After retiring in Williamsburg, Bill volunteered for ten years as an interpreter at Jamestown Rediscovery Archaeological Project at Jamestown Island, and the couple has set up contributions for the maintenance of the site. “I have an interest in archaeology,” Bill says, “so it was a really interesting way for me to get involved” in local history.